During our van build I wasn’t shy about Googling the crud out of what living life in a van would really be like. There are some great resources out there to help prepare you for the highs and lows but one of the most consistent concerns I found was always around where to sleep at night. In some cases, it was listed as a real detractor from the van life experience. I’m not reinventing the wheel here but we’ve had some amazing luck with the resources below and hope it helps you on your van life adventure! iOverlander– This was an app recommended by @NomadicMichael, and while we haven’t used it much, the interface is super user-friendly and provides you with a list of nearby spots based on your geolocation. Allstays: Camp and RV– Alright. It’s expensive. Whether it’s due to the cost or it’s innate nature to capture that which we seek, this is probably the one we use the most. The spots are reviewed and input from the community so you might be able to find a hidden gem that isn’t listed outside the app. With that in mind, it has definitely brought us to the best ‘off the beaten path’ sites. An added bonus is the fact that the app also includes information RV dwellers may need like clearance information, Walmarts (and other businesses that allow overnight campers) dump sites, rest areas and more. https://freecampsites.net/ – The site could definitely use a revamp but you get exactly what the name implies. It’s widely used and more often than not if you do a cold google for ‘free campsite in _______’ this is the site that populates your results. Boondockers Welcome– Their tagline is, “SAFE. LEGAL. FREE. Overnight boondocking on fellow RVer’s property.” I mean, come on [heart eyes]. There’s a $20-25 fee (can’t recall) to which we are members and the few experiences we’ve had with the site have been awesome. Think of it like couch surfing for car camping. If you’re lucky, you might even strike up a conversation with your host and learn something. Hipcamp– Hipcamp is well, exactly that. The idea for the site arose from the difficulty campers face in reserving sites via Reserve America. Combine this with awesome photographs that capture that just so morning light and you have quite the hip camp (a gal can make a dad joke, right?). The real conundrum here is that the spots you can book through the site not only cost money but some of them cost a nice sparkling pretty penny. I dare you not to get lured in by the miles of rolling hills and bleating sheep over yonder. The Outbound– This site can be used in a few different ways. We love and trust their content so we might hop on over to their site to see what they’ve recently been posting about- if it’s nearby, we’ll give it a try. The other way is to locate their search box at the top right and type in ‘camping ________’. They don’t populate these on a map so it’s more of a guessing game but with photos, reviews and friendly articles attached, you’re sure to find some amazing stuff. Campendium– An awesome website dedicated to helping campers find their nightly spot. You punch in your desired state and then are free to narrow down through filters. The Wright Guide to: FREE and Low-Cost CAMPGROUNDS– While the internet has the answer to everything, what happens when you suddenly realize you don’t have a cell connection any longer but still need to find your next overnight location? Enter: the book! OoooooOOOoooh. Jokes, but really, this is a super easy to navigate book with a wide breadth of knowledge. Buy it just to have on hand. Walmart– Aww, Walmart, how we’ve come to love and appreciate your behemoth of a parking lot. Truthfully, I was a bit nervous about the ol’ Walmart trick. I didn’t like the idea that just by being there, everyone around knew that we were inside. There is no longer the illusion of a parked car waiting for their driver to trot on over in the morning. In reality, these nights have been some of those where I feel the safest. Reason being? All of the parking lamps stay on and illuminate the area like it were day. Now I know this isn’t everyone’s cup of tea but for us, Walmart is a safe spot to rest your head and is a quick Maps search away. Two things to note- not all Walmart’s allow overnight stays and always park on the outskirts of the lot, away from the morning traffic. Check here for the No Overnight Parking list. Rumor also has it that if you call and sweet talk the manager they may give special permission. Cracker Barrel, Flying J’s, many casinos- No experience here but I know that if you call ahead and ask about overnight regulations it could save you some under eye bags. 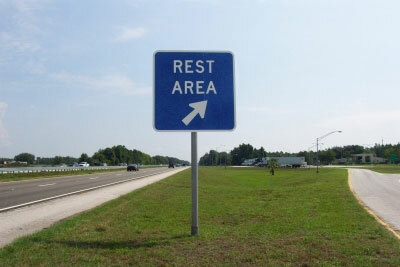 Truck stops/ rest areas– Never done it but if you find yourself rolling your head as you round out your eighth hour of driving, be a pal, pull over and get some rest at the nearest spot possible. FULL RV Parks and Campsites– In this case, the old addage, “ask for forgiveness, not permission” isn’t exactly appropriate. Sometimes, like the above, you’ve driven all day to get to that dreamy campsite only to find it’s alllll full. What to do? In real desperation, you can ask the ranger/ office manager if you can pay a small fee to stay in their parking area and be out early. Heck, if you’re feeling really bold, you might even ask a saint whose already got a spot and make sure to throw them some cash/ snacks/ hugs/ whatever their poison. Instagram– Use Instagram’s location tags to your advantage. Scroll around until you find a few people who may be able to help- people who recently camped in the area or live in a similar situation. They may not have specifics but if anything, you’ve made a new bud. People in town– Hop out of your van, go to the local library, coffee shop, bar etc and ask! Locals are always going to have the best advice and warnings that can’t be found online. The street– This took me a full four weeks to truly feel comfortable with and really I think it was perfectly timed with our arrival in Carbondale, CO, the cutest little mountain town. In reality, you have to ask yourself two questions, Do you feel safe? Are you comfortable with a police officer knocking on your van door and asking you to leave? If the answer is yes, go for it! We prefer to park under a light and landed on a spot that had other boondockers around. With the growing popularity of van/ RV life, there is always safety in numbers. We know this is not a completely comprehensive list and that there are plenty of you out there with insider tips. Let us know through our contact page and we’d love to add them!